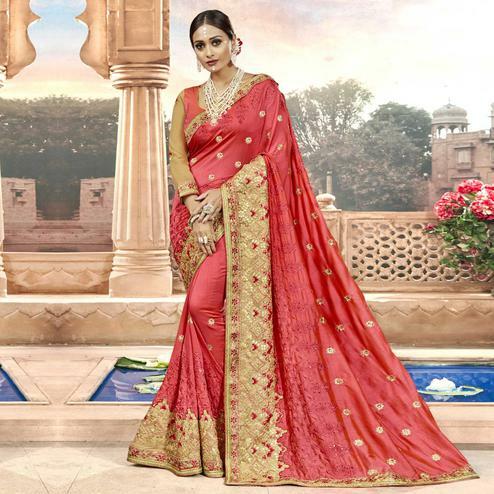 Surround yourself with endless compliments with this majesty peach colored lycra saree. This party wear saree is prettified with attractive embroidered work. Available with unstitched crepe blouse piece, which can be stitched as per your choice & requirement. Pair it with classy accessories to make your look more beautiful. Specially designed to wear for weddings, parties, functions & occasions, where you want to be center of attraction. Buy this saree now as it's a unique piece with attractive color which is rare to find. Note:- The actual product may differ slightly in color and design from the one illustrated in the images.